Looking for a cute and easy edible gift? Look no further! These Peppermint Chocolate Spoons take about 5 minutes to make, and they look so cute when packaged with a mug and a box of cocoa mix or seasonal coffee! Use them to stir your favorite beverage, or just munch on them plain when no one is looking. I like using dark chocolate, but you can substitute milk or white chocolate, or use a variety of different chocolates for a beautiful assortment. 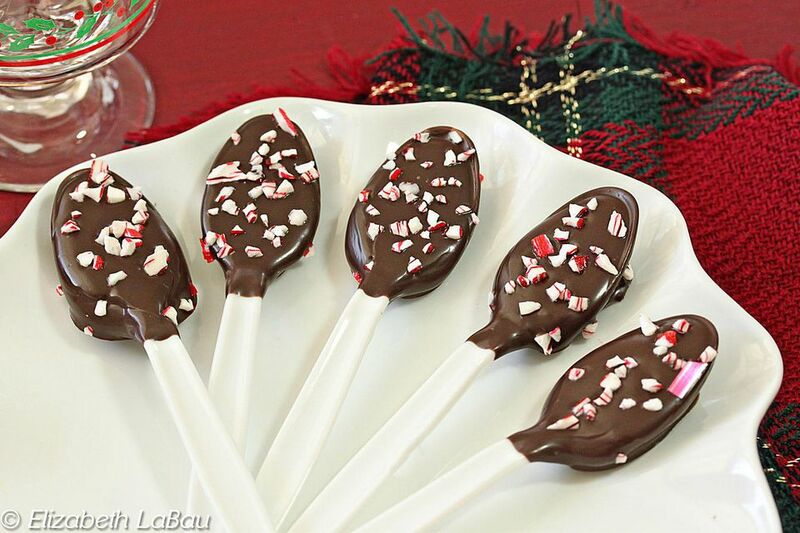 Don't miss the video showing how to make peppermint chocolate spoons! Crush the candy canes by placing them in a blender or food processor, and pulsing it on/off until the candy is in small pieces. Alternately, you can place the canes in a plastic bag and use a rolling pin to finely crush them. Separate out the large pieces for another use, and place the small shards in a bowl. The crushed candy pieces will get sticky if left for a long time at room temperature, so if you are not going to immediately use them, place them in a Ziploc bag to protect them. Place the chocolate in a small microwave-safe bowl and microwave until melted, stirring after every 30 seconds to prevent overheating. Once the chocolate is melted and smooth, begin dipping the spoons in the chocolate. Hold a spoon by the tip of the handle and dip it in the chocolate so that the bowl and a bit of the handle is covered. Set the spoon down on the baking sheet, and sprinkle the top with a big pinch of candy cane pieces. Repeat until all of the spoons are dipped. Place the spoons in the refrigerator to set the chocolate for 15 minutes. Once set, the spoons can be packaged and given as gifts. The spoons should be fine in most room temperature environments, but they will start to melt if they get warm. They can be stored for over a month in an airtight container in the refrigerator. Click Here to View All Christmas Recipes!